For visitors or locals, a guided tour by bike can be a unique way to see the sights. With my left thumb, I clicked over from low to medium as I circled the empty parking lot. Gauging the distance to a pair of cyclists in front of me, I pedaled hard and … whoa, I was right behind them. One more click to high and I was past them, banking and braking to stay in control on the next turn. I was with a dozen tourists trying out power-assisted bikes in the Century Link Field parking lot. We went around once, then twice, and then the whooping began. I felt 12 years old again, and the faint hum of the electric motor was a fair substitute for the clicking of a playing card inserted into the spokes. Fortunately, there was plenty of room to maneuver, which was the point of the first leg of this e-bike tour of Seattle. 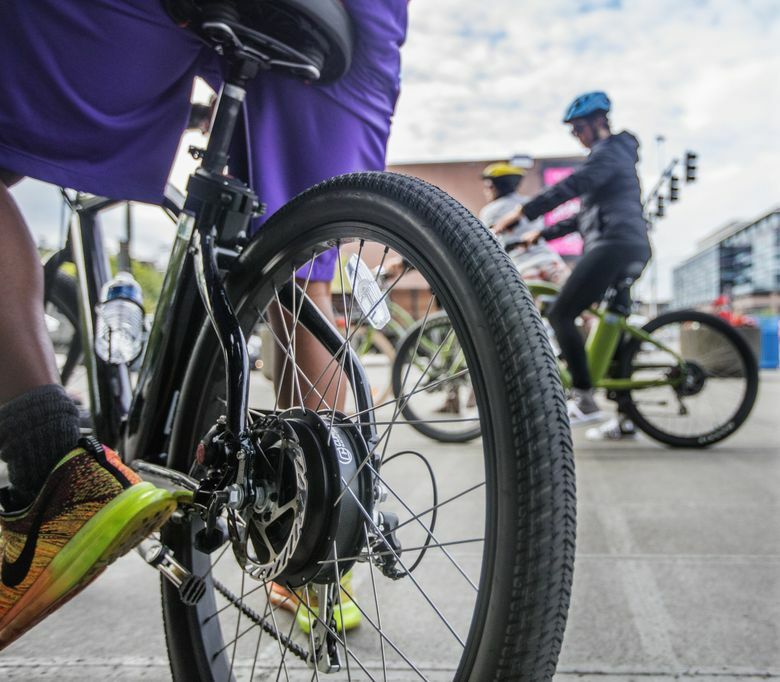 Get used to the power beneath the pedals before taking the electric bike into bike lanes, merging with traffic or weaving through pedestrians in crowded Pike Place Market. 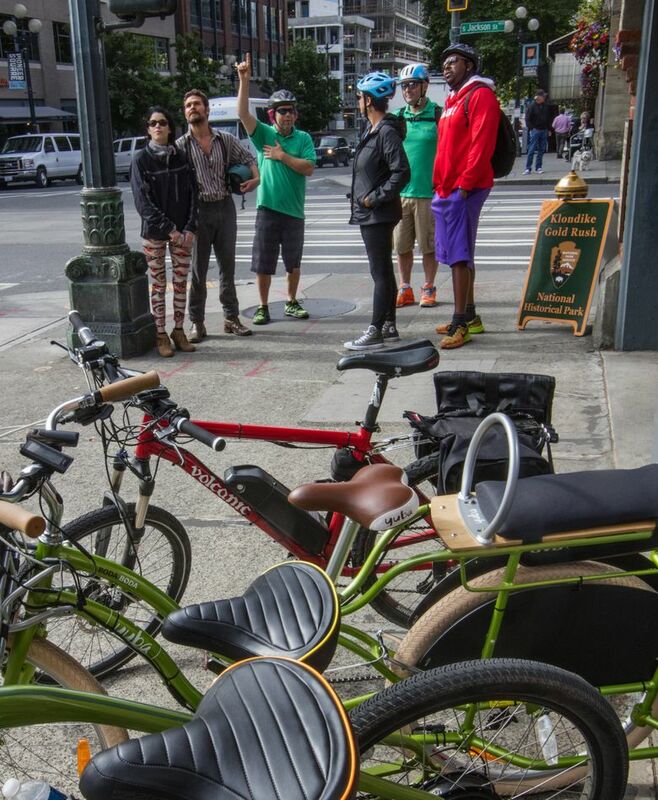 I’d joined a Friday morning guided tour offered by Seattle e-Bikes, based in Pioneer Square. 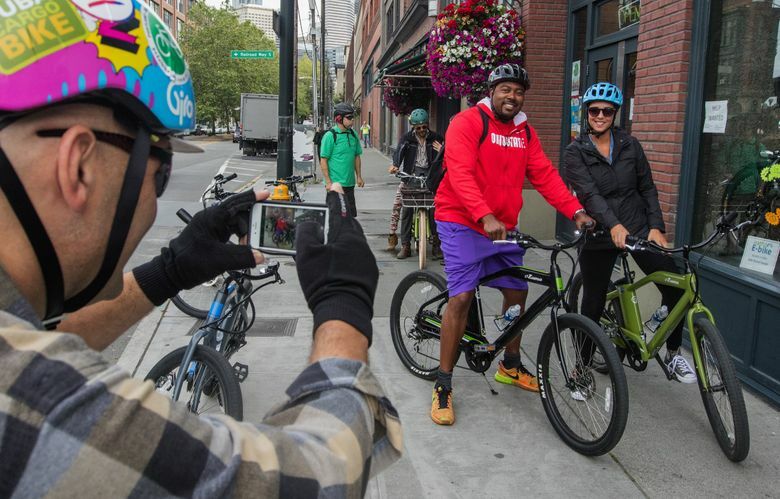 Led by company vice-president Jeremy Cooper, a bit of an electric personality himself, as it turned out, the tour was set to cover central Seattle in about 2½ hours. “We can make it a little faster,” he told us. Of course we could. We had the power. 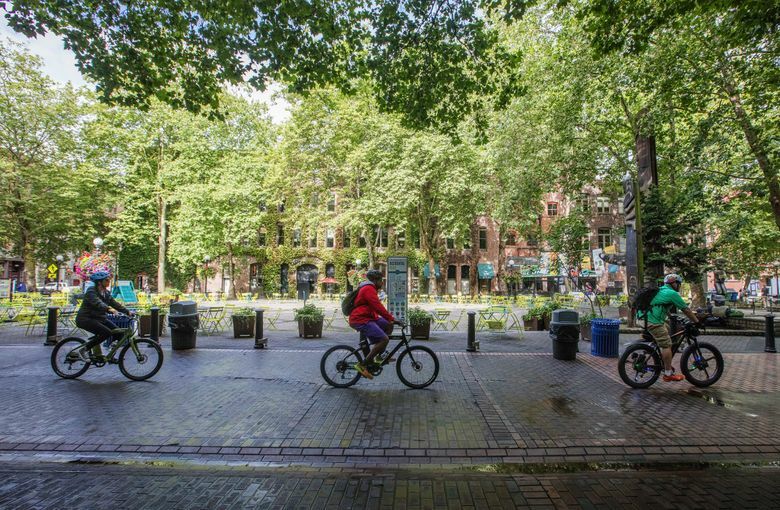 For tourists — or locals who don’t own a bike or know their way around Seattle — a guided tour by bike can be a unique way to see the sights. The pace is slower and there is no pane of glass muting the scene between you and the attractions. You can use more of your senses, also experiencing the sounds (traffic, a busker, the hum of a pedestrian crowd), feelings (wind, misty rain or, hey, warming sun) and smells (from the seawater tang to flowering trees to cannabis) that make our city unique. Like many cities, we’ve long had pedal tours. Seattle native Craig Scheak has been operating Seattle Cycling Tours since 2007. On his three-hour tours on conventional bicycles (bikes provided) you’ll glimpse history and culture along with tourist sites. Many bike shops will rent you a bike so you can do your own adventuring, like musician David Byrne famously wrote about in “Bicycle Diaries.” He takes his folding bike on tour, pedaling to escape routine and seeking to get a little lost and make a delightful discovery. And for those who like to tour in a relaxed way without too much effort, an e-bike tour is a welcome option. “Whoa, look at that, I just rocked that hill!” said Lara Wilson, of Santa Rosa, Calif., who had joined our e-bike tour with two girlfriends. The hill in question was a steep climb from Pike Place to First Avenue on Virginia Street. Not far, but daunting to a casual cyclist in tourist shoes. The prospect of easily climbing Seattle’s famous hills could seal the deal for many tourists. Elevation change between neighborhoods has been cited as a limiting factor in the use of Pronto’s by-the-hour bike-rental system (the bikes seem to wash up at the downhill stations, like fall leaves collecting after a rain). We snaked along Pike Place, cautious to put even an ounce of power behind the pedals in a crowd of distracted visitors. When we parked to down a hom bow bun and sample Chukar cherries, a tour staff member guarded the bikes — and fielded many questions from curious onlookers. Our little gang caused a moment of wow. On to Seattle Center, where we pedaled under the Space Needle, stopped for postcards, then had another “whee!” moment as Cooper boldly led us to turn the International Fountain into a velodrome, dodging both water sprays and wet kids as we easily climbed to the rim of the fountain’s bowl. Scheak’s downtown tour ranges a little farther. He pedals people by the new Amazon headquarters and its emerging hivelike dome, coasts out onto the Bell Street Pier overlook to examine the bay and ventures under the Chinese gate in the Chinatown International District. He also offers tours out to the Ballard Locks, Georgetown and West Seattle’s Alki. 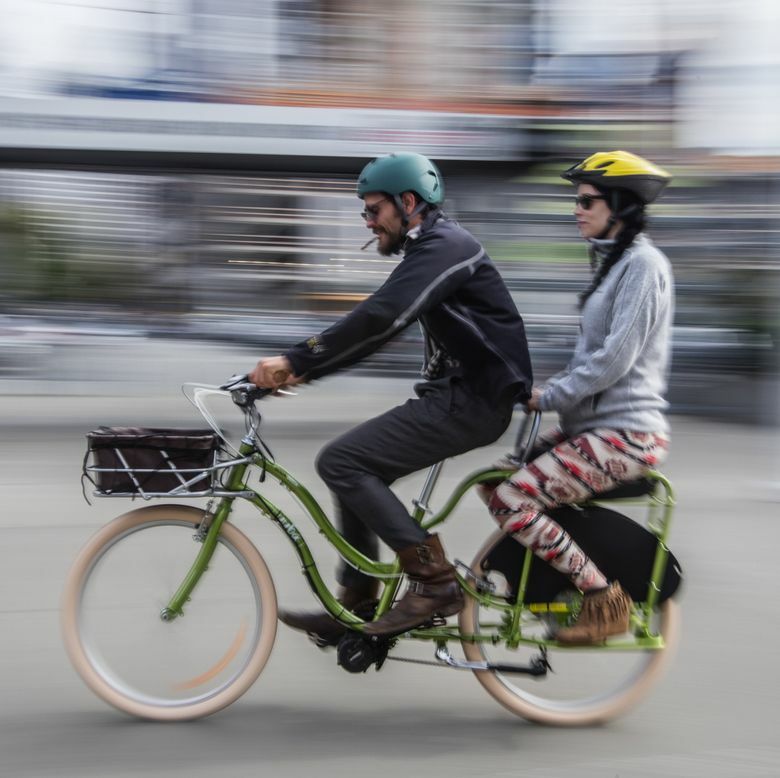 Both his company and Seattle e-Bikes offer Bainbridge Island tours as well, which add the experience of cycling on and off a Washington State Ferry, where you stand on the front of the deck and drink in the stunning city view on the return. Even if you’re a longtime Seattleite who avoids the crowded hot spots, these tours might offer glimpses into city history and lore. Why do our oldest buildings have familiar ornaments? After the great fire of 1889, Scheak told his tourists, developers wanted to rebuild fast, so “they’d go to Philadelphia and find a building they liked, buy the plans, and rebuild it here.” And the design of that clock tower at Amtrak’s King Street Station? “Stolen from Venice,” he said. Teenager Jared Tyranski, on Scheak’s tour with his dad, Chad, and brother Declan, from Washington, D.C., said his favorite stop was “the park with the waterfall.” That would be Pioneer Square’s Waterfall Garden Park, where bike tour guides make sure to let their group know that this homage to the founding of United Parcel Service has a cycling connection. The two friends who started the shipping company on that spot in 1907 began their delivery careers by pedaling packages to their customers. In this age of entrepreneurism, how might that inspire a young visitor from the other Washington, or a recently relocated high-tech worker looking to understand his new home? My e-bike tour walked through the park, then powered up to move. I punched the button on my handlebars and watched the red lights settle on “low,” then followed Cooper, his bike’s boombox pulsating with rock music to announce our parade. As we aimed for the curb cut, a Segway tour approached from the other direction, a line of tourists hovering over their wheeled platforms. “Uh-oh, rumble!” joked Cooper, as one electric-assisted group made way for the other. Seattle E-Bike tours, 206-344-8000 or electricbikeseattle.com. Electric-assisted bicycles provided, with helmets. City tours Tuesday to Sunday, by reservation; $100/person. Seattle Cycling Tours, 206-356-5803 or seattle-cycling-tours.com. Conventional bicycles provided, with helmets. City tours Tuesday, Wednesday and Friday mornings at 10 a.m., and Saturday afternoons at 1:30 p.m.; $55/person. Five other area tours regularly offered, also a fall Walla Walla tour. Seattle Bicycle Tours, 206-697-9611 or seattlebicycletours.com. Discovery Park Lighthouse Electric Bicycle Tour, daily 9 a.m.- noon and 3:30-6:30 p.m., $125. 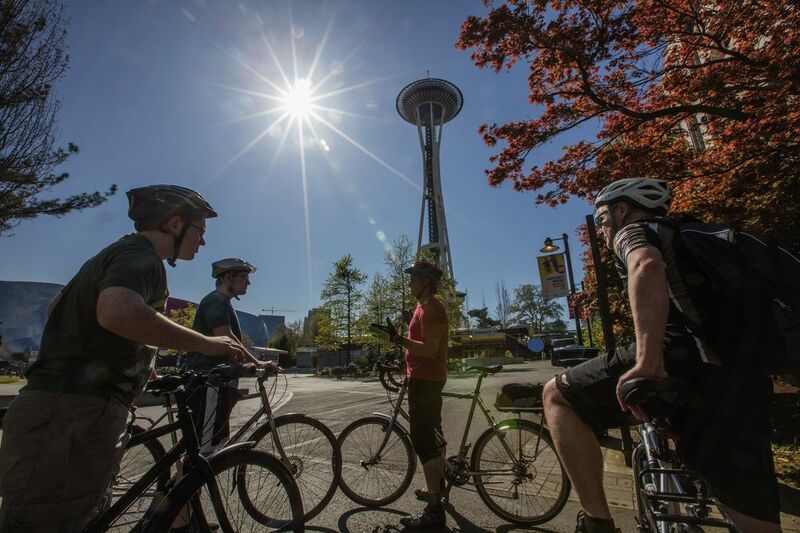 Golden Tour, with standard bikes, daily 9:30 a.m.-12:30 p.m. and 1:30-4:30 p.m., $69. iBike Tours, 206-767-0848 or ibike.org/ibike/seattle/. Custom bike tours, by reservation. Prices vary, see website. Bicycle Adventures, 800-443-6060 or bicycleadventures.com/destinations/washington-bike-tours. Multiday tours of the San Juan Islands, Cascade mountains and Columbia Gorge. Bill Thorness is the author of “Biking Puget Sound: 60 Rides from Olympia to the San Juans” (Mountaineers Books). Contact him at bill@thorness.com.